All the major stats and numbers that Jason Holder created with his double century against England. 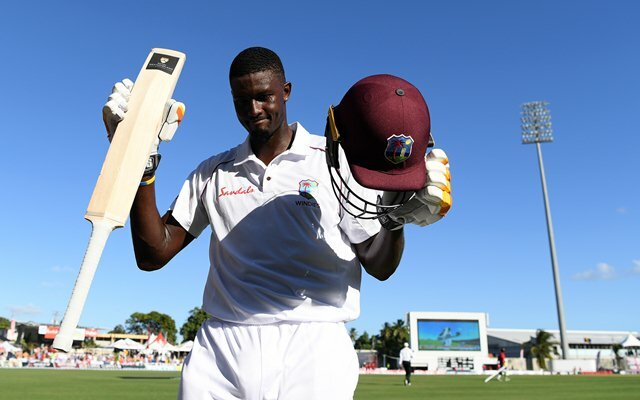 Windies captain Jason Holder guided his team to a massive, rather match defining advantage in the ongoing Bridgetown Test match against England by setting a 628-run target. After taking a massive first-innings lead of 212 runs, the hosts collapsed to 120/6 before the end of day two. Resuming their pursuit of a winning score on the third day of the game, Holder stitched on to a huge partnership with keeper Shane Dowrich. The duo batted for more than two sessions and added 295* runs for the 7th wicket. The skipper, in the process, also scored his maiden Test double ton – 202* counter-attacking the England bowlers while Dowrich backed his skipper with an unbeaten 116. 2 – Holder is only the 2nd player with a second-innings double century while batting at No.6 or lower position in Test cricket. Sir Donald Bradman scored 270 while batting at No.7 during the 1937 MCG Test also against England. 2 – The Shane Dowrich and Jason Holder pair became only the 2nd in the history of Test cricket to share two double century partnerships for the 7th or lower wicket. They had a 212-run stand against Zimbabwe for the 8th wicket during the 2017 Bulawayo Test. India’s VVS Laxman and MS Dhoni had two 200-run partnerships for the 7th wicket at the Eden Gardens in 2010 and 2011 respectively against South Africa and Windies. 3 – Holder is one of the three players in the history of Test cricket to have registered a double century and 10-wicket match haul as captain. Wasim Akram and Allan Border are the only other two captains to have a 200 and 10-wicket haul in Tests. Overall, six players in Test cricket have a 200 and 10-wicket haul in the longer format. 3 – Holder is also one of the three players to have five or more 5-wicket hauls and two or more centuries in Test cricket as captain. Imran Khan has five 100s and 12 5-fers while Daniel Vettori scored four centuries and bagged six 5-fers in this format as captain. 8 – Holder’s eight sixes in the second innings are the 2nd most by a Windies player in a Test inning. Chris Gayle in the first innings of the 2010 Galle Test against Sri Lanka and Shimron Hetmyer in the 2nd innings of the Dhaka Test against Bangladesh in their previous Test hit nine sixes each. 8 – Holder is also the 3rd captain to hit eight or more sixes in a Test inning. Wasim Akram hit as many as 12 during unbeaten 257 against Zimbabwe in 1996 while Brendon McCullum hit 11 sixes apiece during his double centuries against Pakistan and Sri Lanka in the space of one month in 2014. 202* – Holder is only the 2nd captain with a 150+ score while batting at No.8 or lower position in Test cricket. Akram scored an unbeaten 257* against Zimbabwe during the 1996 Sheikhupura Test. 229 – Holder’s 229-ball double century is the 2nd fastest in Test cricket by a Windies player. Chris Gayle got to his 200 in only 221 balls during the 2010/11 Galle Test against Sri Lanka. The Windies captain’s 229-ball 200 is also the 2nd fastest in this format against England. Nathan Astle scored his 200 in only 153 deliveries during the 2002 Christchurch Test; the fastest double century in Test cricket. 229 – The 229-ball double century by Holder is also the 3rd fastest in Test cricket by a captain. Brendon McCullum scored a 200 in only 186 balls against Pakistan in 2014 while Michael Clarke needed 226 deliveries for his double ton during the 2012 Adelaide Test against South Africa. 295* – The unbeaten 295-run partnership between Dowrich and Holder is the 3rd highest partnership for the 7th wicket and the 5th highest for 7th or lower wicket in Test history. Windies pair of DS Atkinson and CC Depeiaza shared 347 runs for the 7th wicket in the 1955 Bridgetown Test match against Australia; the highest stand for 7th or lowest wicket in Test history.